Vacuum Tray Dryer is the most commonly used batch dryer. The box-shaped machine has a door (two doors in case of larger models) for loading and unloading. The product is placed on trays which are placed on heating plates one upon another. Distance between the heating plates is calculated by the surface loading and foaming of the product. The bottoms of the trays and heating plates are kept as smooth as possible for optimum heat transfer between the plates and the product. Now comes the preheating stage in which the product is heated at atmospheric pressure till all trays reach the same temperature, after which the drying can start. 40-80 mbar abs is reached in the main drying phase while only a few mbar abs are reached in the final drying stage. Heating temperatures range normally between 80C and 110C. The drying process requires a few hours to time depending upon the product and its surface load. Automatically controlled vacuum and temperature profiles can be set to prevent going over the threshold of the critical product temperature. Dimensions of the vacuum system play a crucial role in the design of drying cabinets. 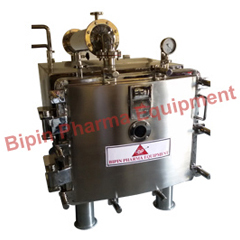 If intense foaming of the product is desired, the transfer to operational vacuum level must take place very quickly so that the vapours produced are taken out directly or through the means of a steam jet compressor and the non-condensable vapours are extracted by the vacuum system. &ast; All contact parts are cast in superior SS304 / SS316 / SS316L grade material in GMP models with mild steel external and stainless steel internal parts as standard equipment. &ast; Dryerâ€™s external heating fluid is encased in protective stainless steel panels. &ast; Dedicated fluid heating and circulating system powered electrically or by steam are available for water as well as thermic fluids with temperature requirement above 95°C. &ast; Dryer comes equipped with validation ports, nitrogen purge nozzles & Halar lined internals for corrosive applications. &ast; Double door loading (for large models) and steam sterilizable models can be made as per clients specifications & requirements. &ast; Easily removable hollow pad heating shelves for ease of maintenance. &ast; Condenser and condensate receiver fixed on the dryer body or stand alone for remote installation. &ast; Vacuum Dryer body can be provided with fully welded skirt for flush mounting through the wall. &ast; Can be designed to serve clients specifications and requirements.